The Chester County District Attorney's Office says this video shows Barry Baker, whose mugshot is seen at bottom left, punching a man with cerebral palsy in the face after mocking him outside a West Chester convenience store. A man is in custody for mocking a man with cerebral palsy and striking him in the parking lot of a Chester County convenience store, the district attorney's office said Monday. Authorities say the incident occurred outside the 7-Eleven store at 200 S. High St. in West Chester at 2:30 a.m. on May 10. 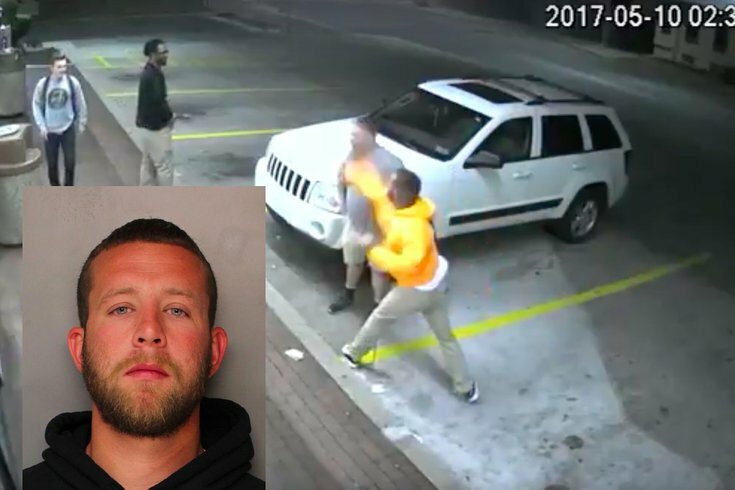 The 22-year-old victim was walking out of the store to his car when the alleged attacker, Barry Baker, 29, of Coatesville, started to make fun of him by imitating the way he walks. Chester County District Attorney Tom Hogan called Baker a "bully" and commended the victim for keeping his cool and notifying police. "Every decent citizen should be outraged by the defendant’s conduct," Hogan said. Baker has been charged with simple assault and related crimes. He was released after posting 10 percent of $25,000 bail. A preliminary hearing is scheduled for May 30.